The film that starts it all. A pioneer film, Donner chose to elevate the story and character of Superman to the highest level, with a great understanding of how to build up a hero and the choices it takes. THE film. Defined the modern hero film with majestic grace (and box-office clout). To this day, I can't picture anyone else as Superman. They made me believe a man can fly. Superman: The Movie set the gold standard for the great modern superhero film. It was a revelation to an audience that knew the character but not the comics. The public knew Superman from the earnest and basic '50s TV series, starring the wryly charming George Reeves. And they knew Batman from the camp apostasy of the '60s TV show. But they were unaware that the early '70s was a crucial renaissance in comics, riding on the advanced skills and ambitions of hippie creators who had raised the form. The 1938 Superman, who invented superheroes and ignited the big bang, was a scrappy egalitarian who yanked warring dictators out of their strategy rooms and forced them to fight each other personally. But after decades of being toned down as a stolid boy scout and father figure, he rebirthed in 1971. He was now akin to "Stranger in a Strange Land", an alien angel as supreme in his intelligence and his compassion as his strength. Not nationalistic but cosmopolitain, not a father but a brother, not a man of stolidity but a luminous soul. This started under Silver Age editor Julius Schwartz and first writer Denny O'Neill. But the new Superman, and his best stories, became truly defined by writers Cary Bates and Elliott S! 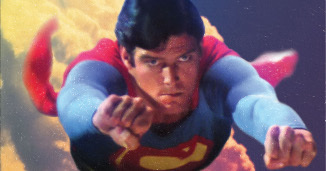 Maggin in "Superman" and "Action Comics" from 1971 to 1974. Curt Swan and Murphy Anderson's art was so perfectly mated and revered that fans called them "Swanderson." Equally, this Superman and Denny O'Neill and Neal Adams' concurrent street-lethal Batman redefined the modern heroes as we know them, for now and the future. Richard Donner's film is a compressed tone poem of everything right that they created. He combines the scope of Lawrence of Arabia with the heart of The Grapes of Wrath. The film is poetic, epic while intimate, at times heartbreaking, and above all, sweetly romantic. And it soars, swirls, and surges on a magisterial score by John Williams so stirring, it still brings tears to the eyes. But all of these accents ride on the performance of Christopher Reeve. Described initially as "a Curt Swan drawing come to life," Chris imbued Kal-El with a dimensionality that we now know as the quintessential Superman: the divine celestial balanced with humane dignity. Donner's triumph really came from faith in the material and the audience, and set the eternal standard for how to do this right.